Saturn, the ringed beauty of the solar system, will put on its best show of the year for stargazers tonight (May 10), and you can catch live telescope views of the planet online. The online Slooh community telescope will offer live views of Saturn from a remotely operated telescope in the Canary Islands, off the western coast of Africa, as the ringed planet reaches opposition, a point in its orbit when it is on the opposite side of Earth from the sun. 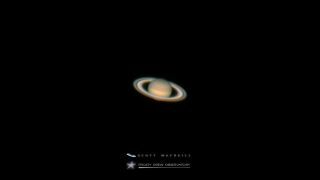 Slooh's feed of Saturn will begin at 9:30 p.m. EDT (0130 May 11 GMT) and feature commentary from astronomer Bob Berman and Slooh host Geoff Fox. You can also watch the Saturn webcast live on Space.com in addition to the Slooh website. Viewers will be able to ask questions about Saturn at opposition using the Twitter hashtag #Slooh. Saturday, May 10, 2 p.m. EDT. Saturn will be at opposition, exactly opposite the sun in the sky. "Saturn has not looked this good since 2007," Berman said in a statement. "That's because its rings assumed their edge-on orientation for several years, making telescope observation of ring detail impossible. Now they are splayed at such a gratifying tilt, they visually form a nearly unbroken structure completely around the body of the planet." Weather permitting, stargazers can spot Saturn without a telescope by looking in the constellation Libra. The planet is the only bright object in the constellation and can be spotted as it rises in the southeastern sky soon after nightfall. Berman said he hopes the Slooh telescope will reveal stunning details of Saturn's rings. "We expect to easily see its famous inky-black Cassini division, situated between the A and B ring, where the ice-chunks that make up its rings have been swept clean by tidal meddling from its moon Mimas," he said. "Nearly everyone regards Saturn as the most beautiful planet in the known universe."